Travel with Kevin and Ruth! : Two places we would love to visit. The other day I came across a photo of a little island, and I published it on our facebook page. It's one of those places that as soon as you see the photo, your first reaction is "wow"! I can see us making it there some day. The second place is also a "wow", but unfortunately we will never make it there! 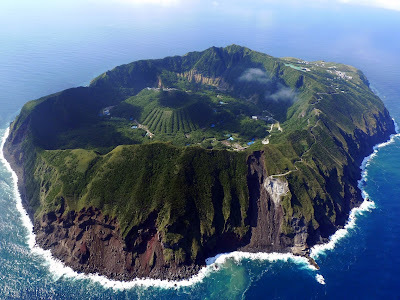 The island of Aogashima lies in the Philippine Sea about 350 kms (200 miles) south of Japan. One of the things that makes this a very cool place is the fact that it is actually a volcano within a volcano! There are just over 200 people living on the island, and although it is classed as an "active" volcano, it hasn't erupted since 1785. There isn't really a lot to do here, and it's not really a tourist place because it's not easy to get to. But it's still one of those places that would be very neat to visit! The second place is even more difficult to visit. In fact, it is so difficult to visit that I know we will never see it. There is an underground mine in the northern Mexico state of Chihuahua that produces silver and lead. 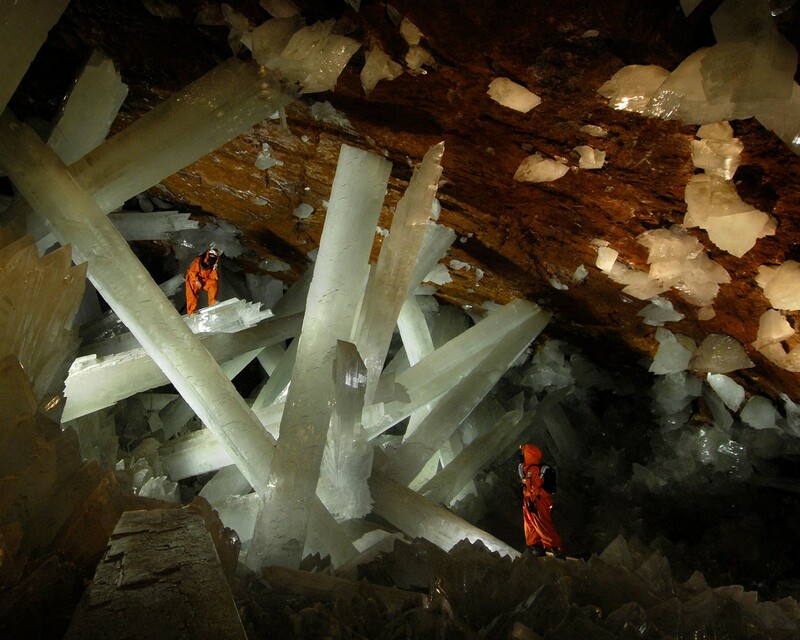 Back in the year 2000, they were excavating an underground tunnel 1,000 feet below the surface when they broke through into a cave filled with giant crystals. Now we like exploring caves to begin with, but this would be like being on another planet. Does this remind you of something out of a Superman movie?? These crystals formed out of gypsum. The water circulating through the cave before the mine started pumping it out had been at a steady temperature of around 58C (136F) for hundreds of thousands of years. When they started the mine, of course they had no idea this existed. The temperature in the cave is HOT, around 50C (122F) with near 100% humidity. So to visit the cave, you need special protective equipment. Besides which, it's not open to the public. So obviously we will never make it to visit this place. And, when the mine runs out the pumps will stop, and the cave will flood once again. Yesterday, we went to visit my sister and her (our) 20 year old cat. When we took off on our motorhome adventure, our cat Molly was already 15 years old. At the time, she was adopted by my sister, and she's going to be 20 on July 1st. She is definitely looking old though! Ruth with Molly the 20 year old cat! Time to vote, only five days left! Two very interesting places to visit. Too bad you can't see the cave, but the island would sure be nice. Both of those are beautiful places... I would love to see those crystals too and yes it definately looks like Superman's place! That cave is crazy. If it weren't for the two people in there, you'd have no idea as to the scale. I'm sure it was nice to see Molly. She's hanging in. Our last cat only lasted to 14, but we have friends who had a cat who lived to 22. A few years back, after we hadn't seen them for a while, (like, lost touch for over a decade) and when we were catching up, we saw their cat wander by, and it looked awfully familiar. Well, it was the same cat! She was about 18 at that point. Both would be amazing places to visit! I received that exact photo in an email of amazing places. Yes...amazing is the correct word. The header is wonderful. They both look so content. Aogashima looks awazing! So does Molly for 20 years! Have cast my vote! Wow a 20 year old cat! She has great genes and your family has taken great care of her. Hope she's feeling good though elderly. And hope she remembers you.....Let's see 20 x 7 is 140. I'm not sure I'd remember anyone at age 140. That's a great looking kitty for 20 years old!! You should have taken her along with you!! Greg White has one that's 17 years old and still WHIPPING ANY DOG THAT COMES AROUND; IN FACT HE HUNTS THEM!! YES, I DID VOTE TODAY AND I'M GLAD!!! No, I don't think Molly would have been happy in the motorhome. She never liked getting in the car, so I think the motorhome wouldn't have worked! We came home from a month in Texas this week. Went to McAllen, South Padre Island, San Antonio (rental house repairs), Three Rivers at the Choke Canyon State Park, and then back to the RGV for a couple of days before returning home. We had the cats with us. The older one has no problems, he's 12 and just hangs out. I can let him out and he won't go very far and always comes back. He uses a leash also. The four year old is a ferrel cat and just gets to ansy being inside for weeks. But in the car, they sleep all day while we are on the road. Wow! That island almost doesn't look real!